With the holiday season upon us, here’s one unique gift you can share that lasts for months (and maybe even a lifetime): our Lexington Irish dance classes! With a variety of different classes and events coming up this winter and spring to try, we’re sure you’ll find something you love. Join our Lexington Irish dance school for classes, workshops and more! Registration is open now via the Lexington Parks and Recreation website. Click here to register and click here for our schedule. Classes begin February 5 and go through May 7. Cost for the session is $60. Registration is open now for December and January classes for adults. We’ll be focusing on material for performance and competition. Read more and register now. Cost for the session is $60. It’ll be a toe-tapping good time at this exciting Irish dance workshop in Lexington this January 13-14. Take one class or take them all! Read more and register online now. Cost for the workshop varies depending on what you take. Full registration for two days is $100. Each of our weekly Lexington Irish dance classes focuses on the basic techniques of Irish dance, with an emphasis on group (ceili) dancing. In our Artworks classes, specific instruction includes standard ceili dances and original choreographies for performance. 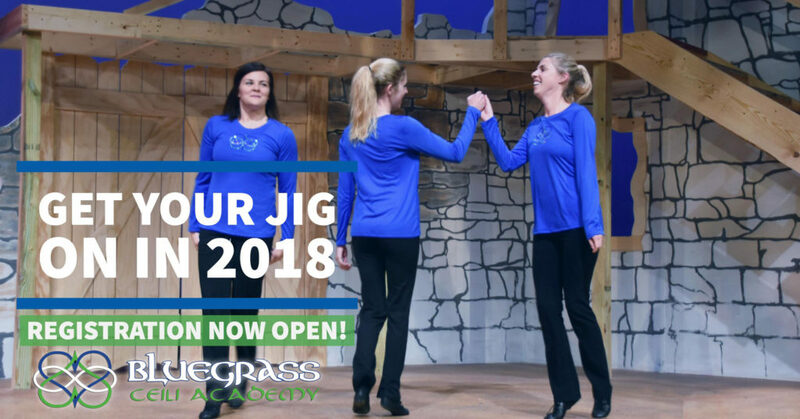 So whether you’re giving something new a try … or coming back to something old … 2018 is the year to check out Bluegrass Ceili Academy! Perspective. Experience. Community. Mission. It’s what matters. It’s how we strive to teach our students teamwork, self-confidence, adaptability and graciousness. It’s the way we look at things, the experience and legacy we bring to the classroom, it’s building and giving back to our community, and living our mission by providing a supportive learning environment for dancers of all ages and skill levels. Find out more about our Lexington Irish dance school by connecting with us online via our Facebook, Twitter, Instagram, YouTube, Google+ and Snapchat accounts or sign up to get our periodic email newsletter.